We’d love your help. 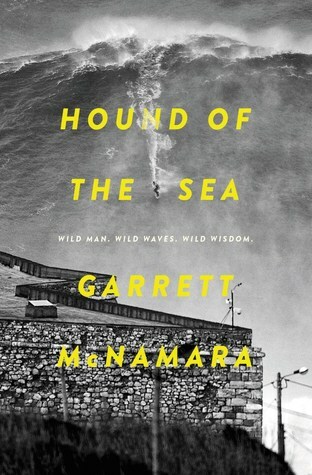 Let us know what’s wrong with this preview of Hound of the Sea by Garrett McNamara. Garrett McNamara—affectionately known as GMac—set the world record for the sport, surfing a seventy-eight-foot wave in Nazaré, Portugal in 2011, a record he smashed two years later at the same In this thrilling and candid memoir, world record-holding and controversial Big Wave surfer Garrett McNamara chronicles his emotional quest to ride the most formidable waves on earth. Personal and emotional, readers will know GMac as never before, seeing for the first time the personal alongside the professional in an exciting, intimate look at what drives this inventive, iconoclastic man. Surfing awesome giants isn’t just thrill seeking, he explains—it’s about vanquishing fears and defeating obstacles past and present. Surfers and non-surfers alike will embrace McNamara’s story—as they have William Finnegan’s Barbarian Days—for an intimate look at the enigmatic pursuit of riding waves, big and small. To ask other readers questions about Hound of the Sea, please sign up. Garrett Mc Namara não é só quem surfou aquela onda gigante na Nazaré, é também e acima de tudo o vivo exemplo de que nunca é tarde para se recomeçar, para se mudar de vida e fazer diferente, fazer melhor. Ao longo de "Lobo do Mar", Mc Namara dá-nos a conhecer a sua história de vida meio atribulada, levada muitas vezes ao limite por uma certa inconsciência, despreocupação e ausência de regras. A dada altura, decide mudar completamente de rumo, vendo no surf uma forma de vida e concretização. E é Garrett Mc Namara não é só quem surfou aquela onda gigante na Nazaré, é também e acima de tudo o vivo exemplo de que nunca é tarde para se recomeçar, para se mudar de vida e fazer diferente, fazer melhor. Ao longo de "Lobo do Mar", Mc Namara dá-nos a conhecer a sua história de vida meio atribulada, levada muitas vezes ao limite por uma certa inconsciência, despreocupação e ausência de regras. A dada altura, decide mudar completamente de rumo, vendo no surf uma forma de vida e concretização. E é assim que, em busca de uma grande onda, chega a Nazaré em 2011 e surfa uma onda de quase 24 metros, entrando para o Guiness e tornando a vila mundialmente conhecida. A partir daí a sua vida mudou. A da Nazaré também por causa das ondas gigantes que ali se formam a dada altura do ano, atraindo inúmeros surfistas de todo o mundo e contribuindo, por sua vez, para o crescente desenvolvimento da economia local. This is the story of Garrett McNamara, a surfer from Hawaii who holds a Guinness record for surfing the worlds largest wave. This wave, incidentally, is off Nazare, Portugal and the events surrounding that wave are a very exciting section at the end of the book. Autobiography or Biography? Not sure; the main author is clearly McNammara, and his voice is so strong and individualistic that the book very much feels like a straightforward person telling you about themselves, there are no literary flo This is the story of Garrett McNamara, a surfer from Hawaii who holds a Guinness record for surfing the worlds largest wave. This wave, incidentally, is off Nazare, Portugal and the events surrounding that wave are a very exciting section at the end of the book. Autobiography or Biography? Not sure; the main author is clearly McNammara, and his voice is so strong and individualistic that the book very much feels like a straightforward person telling you about themselves, there are no literary flourishes. There is a co-author given, though not one I had heard of (and, perhaps more importantly, not one I can get GR to accept, so; my apologies co-author, if you exist) . For about the first hundred pages, this is the story of how McNamara and his brother grew up. This was very much the 60's - 70's hippy, commune era and their growing up was very unusual by today's standards. This part is interesting though after a while I started getting impatient to get back to the ocean. I think that a whole book could be written about this era and that it was trimmed down to anecdotes that the author felt helped shape the core of who is is. This part also suffered a little from continuity problems (more on that latter) and I personally cringed at the childish animal cruelty stores that the author.authors seem to find amusing and endearing. When we reached Hawaii it became fascinating! Personally, I am not a surfer. I did one lesson on my 30th birthday, I nearly killed myself with my own board and the two students next to me were lucky to escape un-maimed. I don't even know anyone who surfs. What I am is an ocean addict, anything marine fascinates me and it is very hard to find books which capture the joy, fascination, awe and sheer blood pounding amazement of the oceans and seas. This visceral response to the ocean seems to be very much a feature for surfers though, so I enjoyed this book on that level. Hawaii of the 70's? 80's? was fascinating to read about, the surf culture was unique in so many ways and I loved reading about the surrounds in which McNamara became a pro-surfer. The culture and the place were clearly a big part in shaping him and I really enjoyed the blunt, uncompromising way in which he describes himself and his journey to becoming who he is today. He did some pretty dumb and pretty unconscious things but I certainly respect the way he owns them without excuses and then evolves his own mindfulness and goes his own way . The point in his life in which he looks around at who and where he is, decides consciously what he wants it to be and then gives anything to following that goal is inspirational. He does that at the stage when most people just accept that there life is what it is and give up their dreams. I loved that he did change it around and became a pro surfer of large waves much older than more pro surfers seem to make it. Now of the ocean; the deep understanding of how waves work, how all the factors including the wind and the shore line shapes them and the sea beneath them affects the wave show an ongoing obsession with the ocean and it's moods, the very thing I like to read about but which is rarely written. Also, the deep respect for the oceans that produce waves and which are untamed and often unpredictable comes through in the writing quite beautifully. The lyrical descriptions of the waves and barrels are everything that made me start keeping an eye out for books by/about surfers. It seems that we follow the authors personal experiences of the waves, sites and individuals in a way that is a linear experience for him, which on the whole does not impair the strengths of the book but may leave some readers adrift. I was able to largely gloss over timeline or location confusion and concentrate on the actual surfing experiences, which are beautifully described, the wipe-outs which are terrifying exciting and as the cover says: Wild. Being a weak swimmer, suffice to say surfing is completely foreign to me. However, I still remember the first time I saw that photo on the cover. I had goosebumps. Garrett's life is a surprisingly interesting read. A true cast of characters. His passion for surfing is obvious and contagious. Perhaps it's time to craft my own blueprint and take swimming lessons! I think I was looking for something a little more literary, a la "Barbarian Days." Instead, this was a too-long account of McNamara's bizarre nomadic upbringing and his (boring) moves in the surfing world. His voice is leaden and repetitive, and I lost interest halfway through but powered on. McNamara's surf memoir is a worthy read if only for the fact that he was the first to conquer surfing a 100 ft wave. This work chronicles McNamara's life from childhood through the present. With respect to non-fiction memoirs written by prominent personalities from the surfing world, I make it a point to read them all. Unlike other athletic pursuits, surfers rarely take time to write about their sport. "Hound of the Sea" is a story written by a surfer for surfers. The title is a reference to the McNamara's surf memoir is a worthy read if only for the fact that he was the first to conquer surfing a 100 ft wave. This work chronicles McNamara's life from childhood through the present. With respect to non-fiction memoirs written by prominent personalities from the surfing world, I make it a point to read them all. Unlike other athletic pursuits, surfers rarely take time to write about their sport. "Hound of the Sea" is a story written by a surfer for surfers. The title is a reference to the author's Celtic surname meaning "hound of the sea". Unlike Finnegan's "Barbarian Days" and Duane's "Caught Inside," McNamara's story doesn't come across as a literary, colorful, masterpiece of prose. Nearly all the chapters are 5-6 pages long that address specific milestones or memorable moments in the author's life. The first 77 pages seemed pretty unremarkable at first, but later it was clear how the early non-surfing years of the author's life gave shape to his life goal "To Keep Surfing". What I really enjoyed about reading this book was the honesty and mater of fact transparency the author so humbly offers to anyone interested in really knowing what it is to walk in his shoes (or more appropriately his flip flops). Among the elite few who've ever surfed "Jaws," "Teahupo'o," "Mavericks," or "Cortes Bank" to name a handful of big wave spots, at one point or another, these surfers all discover that what they do in the water is like living in a fish bowl. The chapter titled "Incident at Cortes Bank" is one example of how the opinions of non-witnesses and media could really crush a person's spirit. This was a really important passage and I'm glad McNamara chose to include it. What I didn't enjoy reading about was the cavalier attitude toward including marijuana and other drugs in the surfing lifestyle. True as it may have been for McNamara, it is sad and disappointing to be reminded that not every surfer (even those who are tremendously accomplished) is a clean living, serious athlete. In the end, what worked for me as an admirer of Garrett McNamara was the "blue print" he developed to become the kind of serious big wave rider who is worthy of historical recognition. In the realm where McNamara operates (riding enormous killer waves), one cannot imagine how these surfers are able to keep fear in check. In his words, brief and concise, on page 219, McNamara says, "Fear is something we create, because we're stuck in the past or envisioning the future. If we stay in the present there is no fear." Coming from a man who'd endured the physical trauma of having his body tortured from the thousands of pounds per square inch and being pounded on reefs countless times, there is no question that Mr. McNamara has the credibility to speak to fear. Snow days are good for something. I enjoyed this book. Not sure it is as good as other memoirs that I have read about other sport/extreme athletes. I do like to learn about how other people get from birth to accomplishment. I have always had a more than passing interest in surfing, so the whole thing was pretty interesting. Probably the most lack luster 4 star review I have ever written. This is a humble, heartfelt account of Garrett's life and a must read. Its up there with Barbarian Days, which is one of the best complements I can give. I LOVE the sea, having been born on the East Coast of England, and then moving to NZ and also living even nearer the sea (200m away) I then lived on the coast of Queensland for 3 years, and now I am back in Invercargill, and drive to Bluff twice a day and I do enjoy the ever-changing view of the sea. My goal is to get back to living with a #seaview again soon. I have always wanted to learn to surf (and I decided to add it to my bucket list after reading this book) OK I doubt I will ride waves as big as Garrett does, but the thing is I've been glued to this book, and it is not just because it's about #surfing, because although it is, it is also about striving for your #dreams #goals and the main lesson I got from reading this book is that you #neverquit. It was a truly inspirational read, at first, the book had my eyebrows raised, his childhood is like off the scale opposite to myself and my husband's, I couldn't imagine how he and his brothers did not fall foul of a sticky end. BUT I do think his unusual upbringing had something to do with the way he looks at life. He talks candidly about his life, the highs and lows, the pages were full of stories that showed his Passion, commitment, friendship, loyalty and honesty. He lives for the moment, for all the possibilities, to pursue your dreams no matter they be big or small. Quote: Fear is a choice, something we manufacture in our in our minds. When we think about the past or the future we become afraid. We're afraid because we remember when something bad happened before and we're scared it's going to happen again. If we are in the moment and enjoying the moment and making the best of the moment, there is no fear. I think the one thing I will take from reading this book is that even when everything was going wrong, he still carried on... this has had an effect on me, So I will keep picking myself up as life throws its spanners in my life, smile and enjoy the journey down this road called life. Guy from dysfunctional family background spins a great tale. His brother, World of surfing, journey of life. Great inspirational story about a young boy raised essentially feral, who clawed his way up and out. Insider's look at the big wave surfing community. Incrível... Riso, choro, ansiedade, adrenalina... Este livro supera expectativas! I have never been surfing and I don't know anything about it, but I did still enjoy this book. review to follow in a couple of days.